First introduced by the Saturday Evening post in the 1940's, this black and white cocker spaniel surged to stardom..
A black and white cocker spaniel named “Butch” was first introduced in the Saturday Evening Post in the 1940’s. Created by artist Albert Staehle, Butch appeared on the magazine’s cover more than two dozen times. Made from the finest mohair plush using archival patterns, he has brown “googly” eyes and features a hand painted coat. First manufactured in 1958 only, “Butch” makes his return in 2014. He is 8-inches tall and features the “Button in Ear” with the elephant motif. 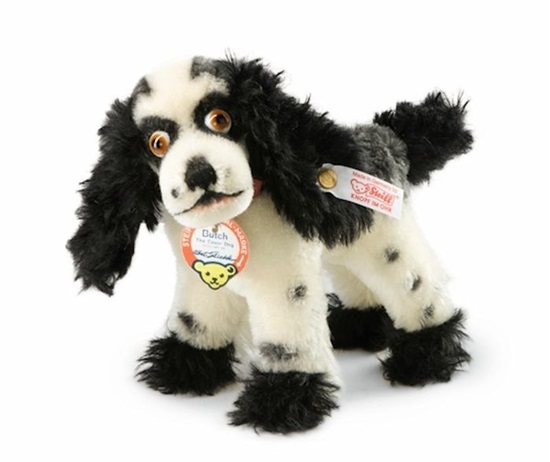 Steiff’s recreation of this adorable famous pup is sure to bring you years of happiness.